The first witness, Manisha Khopkar, told the commission that Ambedkarites were attacked by people carrying saffron-flags and were pelted with stones. Seven months after the Maharashtra state government set up its two-member judicial commission to look into the violence that broke out at Bhima Koregaon near Pune on January 1 and spread into other parts of the state, the commission began its proceedings in Mumbai on Wednesday. The two-member committee is headed by former Calcutta high court chief justice J.N. Patel and former state chief secretary, Sumit Mullick, as a member. The first witness was a 44-year-old graphic designer from Thane who had travelled to Bhima Koregaon for the first time to visit the war memorial on the occasion of the 200th anniversary of the battle of Bhima Koregaon. Manisha Khopkar, in her testimony, told the commission that she, along with 48 others – including young children and older people – had travelled to Bhima Koregaon on January 1. “But over a kilometre and half before the Vijay Stambh (the memorial built to commemorate the defeat of the Brahmin Peshwa soldiers by a Mahar Battalion of British East India Company comprising Dalits in 1818), we were stopped by other fellow Ambedkarites who were running back from the memorial. They had been attacked by some people carrying saffron flags. We decided to get off the bus, remove all the banners that could identify our affiliation with Ambedkarite movement and tried to take shelter nearby,” she told the commission. She further added that while they were taking shelter at a tea stall nearby, they were allegedly pelted with stones by a mob near Sanaswadi. “I can identify a man who was leading the mob… he could be their leader,” she told the commission. Ekbote, a staunch Hindutva leader along with Manohar alias Sambhaji Bhide, also a right-wing leader have been named by some such as Prakash Ambedkar of the Bharipa Bahujan Mahasangh as the masterminds behind the violence. Ekbote was arrested in March and is currently out on bail. He was present at the commission hearing too. Bhide is yet to be arrested. 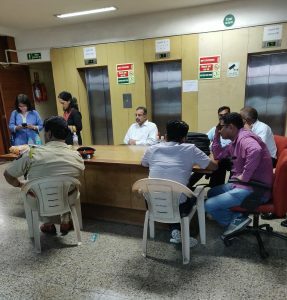 The commission is expected to complete deposition of 12 witnesses, mostly those who were injured or incurred damage in the violence at the gathering, allegedly by Hindutva groups. Khotkar, while narrating the incident informed the commission that her daughter was one among those injured in the stone pelting incident at Sanaswadi. Later when she and others affected in the incident visited the Srinagar police station at Thane, Khotkar said the police refused to register their complaints, she said. “They asked to go to the police station near the spot where we were attacked. In fact, two senior persons from our organisation who went to the police station before us were detained and the police threatened them to file a case against them,” she said. Khotkar’s caste became a point of discussion when the commission members and the lawyers gathered there could not understand why she identified herself as a “Buddhist” and called her marriage “inter-caste” even when she is married to person from a Scheduled Caste. “Are you not a Scheduled Caste?” asked Mullick, one of the two members. Pradhan suggested her caste be noted as “Mahar”. To which, Khotkar objected and said it is unacceptable to call a Buddhist by that name. The commission eventually retain her statement as it is. Special public prosecutor Shishir Hiray, representing the state government told The Wire that over 200 affidavits have been filed on behalf of the Pune police, the revenue department, the state transport, Pune municipal corporation, medical wings, gram panchayats, zilla parishads and panchayat samitis, along with the victims of the violence that affected the Bahujan visitors at Bhima Koregaon on January 1 and the subsequent violence witnessed across the state on January 2 and 3. Ekbote is one of the over 200 people who have filed their affidavits before the commission. In his affidavit, 61-year-old Ekbote claimed that as a part of his organisation Samastha Hindu Agadhi, he has been actively working at Vadhu Budruk near Bhima Koregaon. Vadhu Budruk village in Shirur Tehsil, which is less than four kilometres away from Bhima Koregaon is another significant place in the history, where the samadhi of Sambhaji – son of King Shivaji – was built. It is alleged that Ekbote has been working closely with Maratha youth in the village and region nearby and had instigated them to damage the samadhi of one Govind Gopal (Mahar) Gaikwad next to king Sambhaji’s samadhi. The Marathas have been in dispute over the claim that Gaikwad had gone against Aurangazeb and carried out the last rites of King Sambhaji. Some people from Maratha community claim that it was their ancestors who carried out the last rite. Replicating the Pune police’s claims, Ekbote in his affidavit has claimed that Elgaar Parishad was behind the violence in Pune and other parts of the state. “Extremely acerbic language was used against the prime minister, the chief minister and other leaders of the ruling party at this parishad. Each speaker worked towards instigating the mass,” he clams in the affidavit. This was done even when the Pune municipal corporation had categorically asked the organisers to refrain from making any political speeches. He further claimed that the memorial is visited annually not because Dr. B.R. Ambedkar had decided to visit the site in 1927, but it was due to gangster Haji Mastan’s encouragement that such a celebration was started at Bhima Koregaon in the 1980s. He further claims that he has been given an honourary post of an “animal welfare officer” for having saved over 25,000 cows through his organisation. “I have managed to stop illegal cow slaughter in the state on several occasions,” he claims in the affidavit.